The holidays can be a challenging time for caregivers of patients with cancer. The holiday season brings a wide range of emotions. It is a time when people of many different cultures gather together to create long-lasting memories. However, life is not always so pleasant for caregivers of patients with cancer. For families affected by cancer, the traditional holiday spirit may be the furthest thing from their mind. Many people impacted by cancer have a challenging time accepting their new normal. 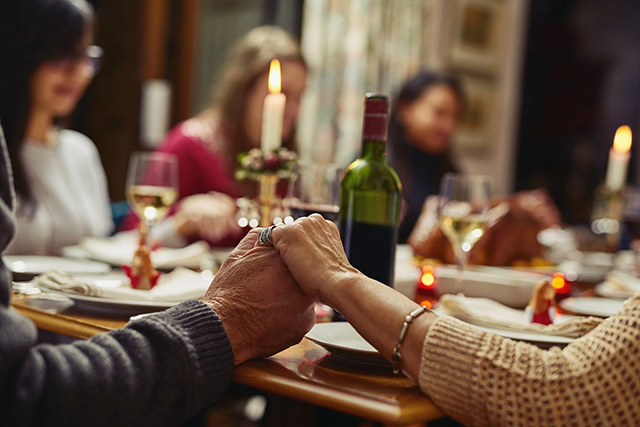 Life as they know it is changing and celebratory moments can prompt questions they may not have considered: How do I emotionally handle this holiday season while caring for a loved one with cancer? How can I express my own concerns without being perceived as self-centered or insensitive? How can I take care of myself and the person I love? What will my life look like next year? Identifying these concerns may alleviate the associated stress and provide a sense of calmness while patients and their families cope through the holiday season. A few helpful tips can benefit a loved one during the holidays. I created the acronym SUPPORT to encompass different ways to seek support while being supportive. Support network A cancer diagnosis can bring about a wide range of emotions not only for the person affected by cancer but for their loved ones as well. As the holidays symbolically represent a joyful time, coping with challenging life changes and complex decisions is often difficult, which is why a support network can help in dealing with the various stages one experiences as a caregiver. CaringBridge helps you set up a free website to keep loved ones informed and list ways they can help. CancerCare oncology social workers provide counseling to anyone affected by cancer: online, face-to-face, or over the telephone. Oncology social workers can also direct you to more resources that address the concerns of caregivers. A social support network can help address emotional concerns and provide useful feedback and coping skills, including how to have honest and meaningful discussions and insightful ways to express your feelings. Understand The concept of understanding stems from being compassionate and thoughtful. Adjusting to change is difficult and especially more so if your loved one is not in the “holiday spirit”; however, having the ability to empathize with that person — being able to better understand what that person is thinking — can be more meaningful than all the external trappings of the holiday season. Imerman Angels and Cancer Hope Network are organizations that connect you to another caregiver who is dealing with the same cancer. They understand your concerns the best and can help normalize your experience, as well as provide suggestions based on what worked for them. Practice self-care The holidays are always a hectic time. Seasonal activities such as decorating, buying presents, and preparing special foods can make taking your loved one to a doctor’s appointment that much more difficult. A caregiver may experience a variety of feelings — sadness, anger, resentment, frustration, and even a loss of hope — under all these demands, which is why self-care is so important. Self-care is defined as identifying your own individual needs and taking steps to meet them. It is also making time to do activities that nurture oneself. Self-care activities can include, but are not limited to, going for a walk, reading a book, exercising, and practicing mindfulness and relaxation techniques so that the caregiver can actively take care of others in the process. There is no right or wrong way of defining self-care as long as it involves investing time and energy to engage in care of self.